Antipasto means, literally, before the meal. 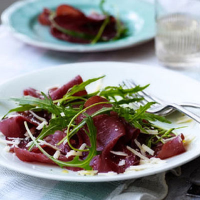 The taste of bresaola is more delicate, yet a little sharper, than prosciutto di Parma – though this would make a delicious alternative here, as would beef carpaccio. Wash and dry the rocket, then divide between 8 plates. In a small bowl, mix together the two oils (you may not want to add all the truffle oil at this stage) with the lemon juice; season to taste. Whisk well with a fork, check the strength of the truffle flavour and pour over the rocket. Mix gently and combine with the slices of bresaola. Grate the Parmesan coarsely and sprinkle over each plate.